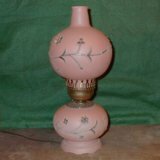 This lamp consists of cranberry color glass body on a pedestal mounted on a marble base.. 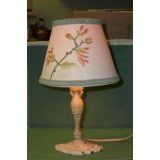 There is a grapevine pattern on the glass..
Iron lamp consists of an iron base. The base is in two sections. The separation is where the base and the vertical section meets. 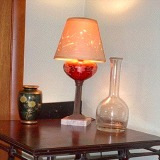 The lamp looks great using a small 15 Watt bulb with standard thread size fixture.. This lamp consists of 2 glass globes. It measures 6.5 inches wide and 15 inches tall. This wall plate looks to be at home in an old style mansion or victorian home..